Black obsidian veins shroud this 6' 3" stud's rockin' bod. His eyes are purple, and he likes long walks on the beach. A victim of the slavers of Ashan, Albion is a lone Oread seeking to reunite with his family. He had been born and had lived with his family and others in a loosely packed but firmly bound tribe of cast-away earthen folk, west by northwest of Osgard in the depths of the Gomezian mountains. His parents were already attune to a life of relative isolation, having been cast out by their respective families for exhibiting the mark of an Oread, deemed a curse in the more elder days. Much of the same story could be found among the other clans that lived among the caves of the Mountains. From there, his people found employ with the Dwarves in Osgard, who had much use for the nature-tuned and hardened Oread bodies. Though he went there to work at first, it was in Osgard where he came to spend much of his leisure, fighting and working with the Dwarves as if they were but a reunited kin. His prowess for combat was well-received, and his responsiveness to advice that enriched his talents proved a welcome relief from the usually stubborn disciples of wrestling in town. In fact, Duran Duran, a legend for his fighting abilities, took keen interest in educating young Albion in the ways of weapons and warfare. Though initially resistant to introducing such an intimate relationship with violence into their son's life, Albion's naturally pacifist parents gave their blessing for his apprenticeship, and he was taken under Duran Duran's wing. Albion returned to find his tribe and family in dire straits. His brother Samson and his sister Marcella remained with his parents, but only two or three other families had presence in the tribe, leaving some dozen Oreads left in the mountains, down a great deal from the fifty that originally populated the region. Most had been captured by the slavers, whose presence had now become a shadow, stalking the group for a stray members to wander off and become exposed. A few groups had slipped out instead, sensing the impending end. Albion saw these Oreads in town before he left, working in the mines and living on the streets. But now he was with his family, sleeping little and watching each each flicker in the distance with paranoia. Sometimes, he'd catch a slaver on his horse, staring him down for hours while Albion would huddle over his halberd, sharpening it ritually. The broken tribe would not leave its territory, taking after their stubborn neighbors to the east, but mostly for refusing to be cast out from the land of their own nature and creation, where some had lived for generations and formed with their own rough hands. Samson was a subscriber to such thinking. A larger, even more heavily built specimen than Albion, he was a slow but immensely powerful Oread, almost entirely consumed by the rocky trait, with the only visible flesh being his eyes. Marcella, however, was much opposed to remaining a painted target for the slavers, and tried in vain to convince the others to flee. She could not leave alone, for her family was all she had. So they remained, crouched and helpless, until the inevitable storm fell upon them. The slavers came boldly at dawn. They had waged a decidedly non-physical war during the night, exhausting the surviving Oreads with jeers and taunts, making heard their weapons against rock faces and the clattering of their war horses' hooves. It had been silent for all of five minutes which made the tribe realize something was amiss, but only too late. The slavers crashed into the caves, scattering the Oreads out the entrances, where more slavers waited, catching them in nets and chains as they rushed out. 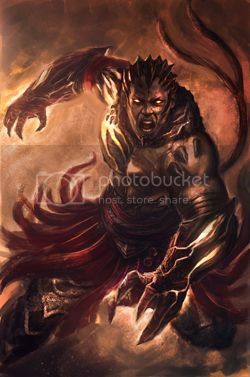 Albion saw his brother crush through four slavers as they attempted to bind him, until a robed one made movements and spoke in an unfamiliar tongue to collapse him. Albion himself fought through two before a boulder trap came down the mountain side and knocked him clean off a huge face. As he stumbled off the edge, he saw his sister evaporate in a cloud of rock and earth before a crowd of raiders, crying out as they were struck by fragments and shards of sharp stone. This was the last Albion saw of his family, his parents no where in sight, and the last of his clan taken and bound. Then all was black as he hit the valley floor. Now Albion awoke, unsure of how much time had passed. He had skidded and tumbled down a cliff, into a deep valley entirely out of view of wherever the slavers had been. He was gravely injured, feeling broken bones in his arms and ribs, but could not return to Osgard for his sense of shame and humility. Instead, he wandered along the coast to Oklana, collapsing in the town and receiving medical aid. He did some manual work there to repay his debts, asked questions regarding the slavers, and was told to head for Goothum. So he departed, battling the elements for days until he arrived in Goothum, living on the streets lost for months with his halberd his only companion. Odd jobs kept him fed, but he was too inexperienced and shy to converse with locals and make connections and friends. Alone in the largest city in Ashan, he was spotted by the shady trader Abercromb, who operated garment stores all across Ashan, but only as a face. He also supported the death arenas which pitted all manner of foe against one another. His standards were not high, as he mostly caught bodies and sold them to others. But upon discovering this huge and weary Oread, bound to its halberd, he sensed an opportunity for a more glorious title. His own fighters were middling, and after easily befriending and discovering the Oread's purpose in town, promised to help Albion if he would display his abilities in the arena. So began Albion's unwitting slave service, where he was paid a pittance and lied to for years, until his fateful encounter with Peregrine and Moira in the Brass Buckle. Now, with renewed vitality, but deep scars, Albion journey's with creatures he may yet come to trust. A gift given from Duran Duran the Dwarf fighter to his one apprentice, Albion Halberg. It is crafted by the steadiest of Dwarf smith hands in Osgard, commissioned especially for the aesthetic of the Oread's body: deep black obsidian runs like veins through the oak shaft, leading to the massive ax, spear and hook head that forms the business end of the halberd. Entrusted to Albion to defend his family, it has not left his side for years, and serves as a reminder of both his failure and his mission.  The Behemoth Halberd is simply a Masterwork halberd.